US prog-metal legends FATES WARNING will soon be taking a trip to Europe to celebrate their recently anniversary of their classic album Parallels, which Metal Blade released as a deluxe edition with live and demo material and a DVD with nearly three hours of material. 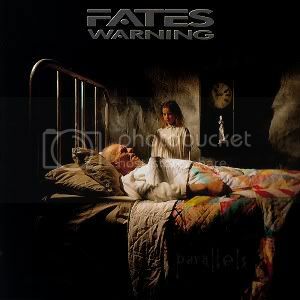 Fates Warning were founded in 1983 in Connecticut and can note ten studio albums in their long and impressing band history so far. Their latest album FWX was released in 2004 and afterwards the DVD Live In Athens followed in 2005 followed via InsideOut Music. Fates Warning 2011 features Ray Alder (vocals), Jim Matheos (guitar), Frank Aresti (guitar), Joey Vera (bass) and Bobby Jarzombek (drums). For more info visit Fateswarning.com.